﻿ The Riverside Pubs Treasure Hunt - Liquid History. A RIVER FLOWS THROUGH IT! An absolutely delightful treasure hunt that hugs the south bank of the River Thames, between Blackfriars Bridge and Tower Bridge, and which combines fascinating history with some really wonderful riverside pubs. Firstly, the views that are to be had as you pick your way along the Riverside Pub Treasure Hunt route are, quite simply, stunning. The soaring, majestic splendour of St Paul's Cathedral will be a constant companion; the equally impressive exterior of Tate Modern, built with approximately 4.2 million bricks, will loom over you for a large section of the quest. One of London's few surviving medieval houses will crop up as one of your clues, as will the oldest gothic church building in the capital. You'll search for a clue on the time-scarred walls of a medieval palace, and seek the solution to another on an ancient stone seat where generations of medieval ferrymen would have rested between transporting their passengers back and forth across the River Thames. The clues that you must solve will cut a truly impressive swathe through the history of London, taking you on a magical journey through 2,000 years of mind-blowing history, from Roman remnants to Shakespearean connections to medieval bishops who ran a decidedly sleazy sideline in debauchery! And then come the pubs. My oh my, what a selection have we chosen with which to entice you. They all stand on the banks of the River Thames, some of them even tottering over the River itself. There's a pub that commemorates one of London's most curious challenges, inside which you will have to undertake several even more curious challenges of your own! There's a 17th century ale house, from which the diarist Samuel Pepys watched the devastation being wrought by the flames of the Great Fire of London on the City of London across the water. There's an old spice warehouse that has been converted into one of London's most atmospheric hostelries. And, finally, there's a bustling tavern that was once the centre of a bustling international trade in lamb, beef and butter. You'll have plenty of time to explore the interiors of this diverse selection of drinking establishments - nay, you'll very much have to explore their interiors as the solutions to several of your clues and challenges are located within their timeless walls. But, what are these challenges? I hear you ask. Well, since you did ask, I'll tell you. From the moment you set out on your pubs treasure hunt quest you must be constantly alert, ever vigilant for the moment when a clue, a question or a photo challenge is going to pop up. They might be located on information boards, on blue plaques, on statues and, of course, on the walls of the historic hostelries you will be visiting. The one certainty is that they are out there somewhere, and so the challenge for your team is to spot them and then answer the question we have posed about them. Be careful though, because the other teams are also out there, plodding their way along the banks of the Thames, desperate to find the solutions to the same clues, the answers to the same observations questions and determined to be the first to romp home to victory and to have answered the most questions in the challenge. Of course, you cannot, under any circumstances, allow that to happen, and so the stage is set for a fun and challenging few hours, during which you must pit your wits against friend and foe alike, as you march on to glory and work with your team mates to work for your crown of victory. You will need to deploy your resources sparingly, plan your strategy with military-like precision. Observation and deduction have never been so important, and neither has the resolve to think about the tasks that have been set you, and to plan how to solve your challenges in the least possible time to give your team the maximum possible advantage. What fate William Shakespeare was indifferent to? Why Deadman's place, one of the thoroughfares you will encounter, was so called? Where Catherine of Aragon took shelter on first landing in London? 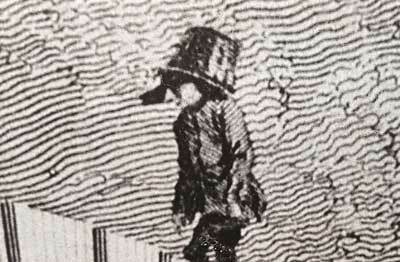 Why the man in the picture has a basket on his head? What Hubbard Ford did in 1975? What Olaf did with Ethelred in 1014? Don't worry, by the time your band of warriors abseil down the walls of the final venue (alright that's a bit of an exaggeration, as you stroll through the door of the final venue), and collapse in a heap of mirth in front of the bar, the answer to every one of those questions, and many more besides, will have been found. Indeed, you'll end the quest with an abundance of fascinating facts and/or bits of useless information that you'll be dining out on for years to come! 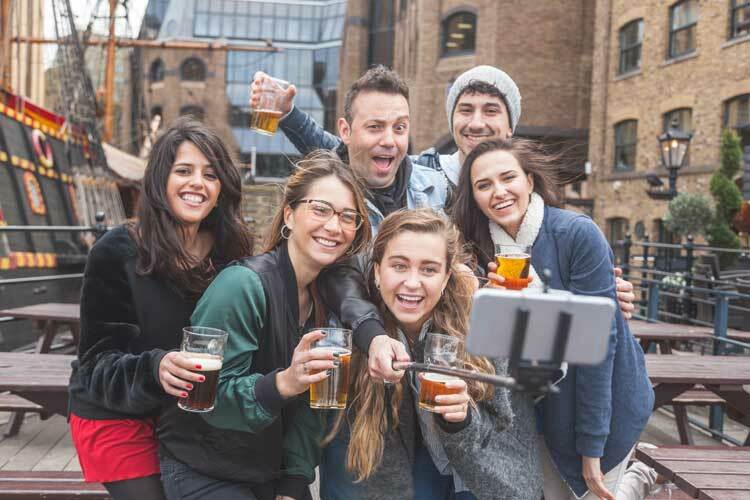 So, whether you are looking for a team building activity, or a social event that will get yourself, your friends and your work colleagues out and about in London, and on which you will discover some fantastic pubs, then give the Riverside Pubs Treasure Hunt a go and see for yourself that there's more to this great City than meets the eye. The cost of the Riverside Pubs Self Managed Treasure Hunt Package is £140.00 for 4 packs. The treasure hunt cannot be started before pub opening times which are generally midday.